Multi-Purpose Professional Precision Hand Tools Screwdriver Set. Compatible for repairing your Cell Phones, PDAs, GPS, Camera, Computer, LG Communication equipment and other electronic equipment. Convenient to carry anywhere because of its portable packing. Ant-slip grip provide precise torque. Allen sockets: M2.5, M3.0, M3.5, M4.0, M4.5, M5.0, M5.5, PH2. Torx: T3, T4, T5, T6, T7. Hexagonal Bits: 1.5, 2.0, 3.5. Hexagon sockets: M5, M6, M7, M8, M10. Phillips bits: PH3, PH2, PH1. Slotted bits: 6.0, 5.0, 3.0. 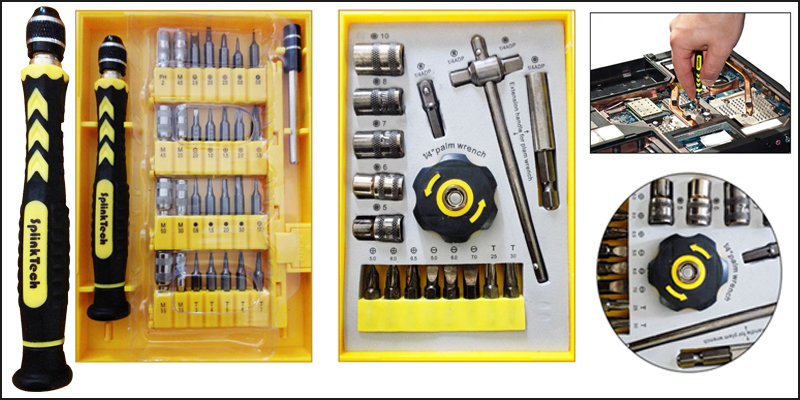 1x Multi-Purpose professional precision screwdriver set.